BLISS will debut its treatments and packages on Gilt Group for exclusive sales in various cities. Also, the products will be on sale as well. If you are not a member what in the world are you waiting on. The details: Log on Gilt.com this Thursday, September 16th at 12PM ET through Saturday, September 19th at NOON ET. Bliss' super-effective bath, body and skincare blends are based on years of tension-nixing, skin-fixing expertise, and will make you look and feel ‘spa’-tacular every day. , a luxurious DIY skin-soother, and more, all up to 60% off! 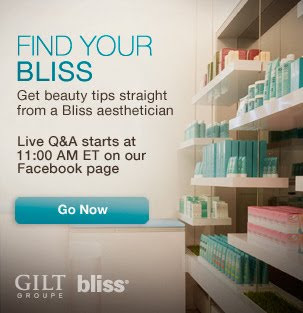 Also, be sure to check out Gilt’s Facebook page for a LIVE Q&A with one of the Bliss expert estheticians on September 16th!